Kershner Signs, South, Burlington, VT, Vermont, Vinyl, reflective, 3M, hand, lettering, painting, Chittenden, County. A Division of R&W Gibson Corp.
Wayne did the reflective lettering on the back of my Saturn which was interesting with the compound curves to deal with. It shows up well in the daytime, at night it really catches the eye! 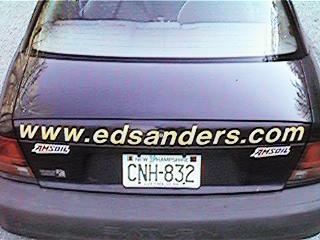 E-Mail: edsanders@edsanders.com Copyright 2000 by Ed Sanders. Kershner Signs, South, Burlington, VT, Vermont, Vinyl, reflective, 3M, hand, lettering, painting, Chittenden, County. Kershner Signs, South, Burlington, VT, Vermont, Vinyl, reflective, 3M, hand, lettering, painting, Chittenden, County. Kershner Signs, South, Burlington, VT, Vermont, Vinyl, reflective, 3M, hand, lettering, painting, Chittenden, County. Kershner Signs, South, Burlington, VT, Vermont, Vinyl, reflective, 3M, hand, lettering, painting, Chittenden, County. Kershner Signs, South, Burlington, VT, Vermont, Vinyl, reflective, 3M, hand, lettering, painting, Chittenden, County. Kershner Signs, South, Burlington, VT, Vermont, Vinyl, reflective, 3M, hand, lettering, painting, Chittenden, County. Kershner Signs, South, Burlington, VT, Vermont, Vinyl, reflective, 3M, hand, lettering, painting, Chittenden, County. Kershner Signs, South, Burlington, VT, Vermont, Vinyl, reflective, 3M, hand, lettering, painting, Chittenden, County. Kershner Signs, South, Burlington, VT, Vermont, Vinyl, reflective, 3M, hand, lettering, painting, Chittenden, County. Kershner Signs, South, Burlington, VT, Vermont, Vinyl, reflective, 3M, hand, lettering, painting, Chittenden, County. Kershner Signs, South, Burlington, VT, Vermont, Vinyl, reflective, 3M, hand, lettering, painting, Chittenden, County. Kershner Signs, South, Burlington, VT, Vermont, Vinyl, reflective, 3M, hand, lettering, painting, Chittenden, County. Kershner Signs, South, Burlington, VT, Vermont, Vinyl, reflective, 3M, hand, lettering, painting, Chittenden, County. Kershner Signs, South, Burlington, VT, Vermont, Vinyl, reflective, 3M, hand, lettering, painting, Chittenden, County. Kershner Signs, South, Burlington, VT, Vermont, Vinyl, reflective, 3M, hand, lettering, painting, Chittenden, County. Kershner Signs, South, Burlington, VT, Vermont, Vinyl, reflective, 3M, hand, lettering, painting, Chittenden, County. Kershner Signs, South, Burlington, VT, Vermont, Vinyl, reflective, 3M, hand, lettering, painting, Chittenden, County. Kershner Signs, South, Burlington, VT, Vermont, Vinyl, reflective, 3M, hand, lettering, painting, Chittenden, County. Kershner Signs, South, Burlington, VT, Vermont, Vinyl, reflective, 3M, hand, lettering, painting, Chittenden, County. Kershner Signs, South, Burlington, VT, Vermont, Vinyl, reflective, 3M, hand, lettering, painting, Chittenden, County.